Class that helps perform jet background subtraction. 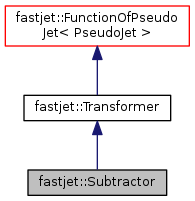 This class derives from Transformer and makes use of a pointer to a BackgroundEstimatorBase object in order to determine the background in the vicinity of a given jet and then subtract area*background from the jet. It can also be initialised with a specific fixed value for the background pt density. The underlying structure of the returned, subtracted jet (i.e. constituents, pieces, etc.) is identical to that of the original jet. Definition at line 62 of file Subtractor.hh. Definition at line 61 of file Subtractor.cc. Definition at line 102 of file Subtractor.hh. when true, if the subtracted mass is negative, we return a 4-vector with 0 mass, pt and phi from the subtracted 4-vector and the rapidity of the original, unsubtracted jet. Definition at line 122 of file Subtractor.hh. This is mostly intended for cherge-hadron-subtracted type of events where we wich to use vertex information to improve the subtraction. sel_leading_vertex amongst the particles with a known vertex origin, select those coming from the leading vertex Momentum identified as coming from the leading vertex will be kept, momentum identified as coming from a non-leading vertex will be eliminated and a regular area-median subtraction will be applied on the 4-vector sum of the particles with unknown vertex origin. When this is set, we shall ensure that the pt of the subtracted 4-vector is at least the pt of the particles that are known to come from the leading vertex (if it fails, subtraction returns the component that is known to come from the leading vertex — or, the original unsubtracted jet if it contains no particles from the leading vertex). Furthermore, when safe_mass() is on, we also impose a similar constraint on the mass of the subtracted 4-vector (if the test fails, the longitudinal part of the subtracted 4-vector is taken from the component that is known to come from the leading vertex). Definition at line 153 of file Subtractor.hh. Definition at line 72 of file Subtractor.cc. a value of rho that is used as a default to label that the stored rho is not valid for subtraction. Definition at line 203 of file Subtractor.hh.